This summer it will be 90 years since Neville Cardus went to Dover to cover Kent v Lancashire, and wrote about it in the most magnificent way for the (then) Manchester Guardian. You can still read his account of all three days – nearly six large pages of small type; thousands of words – if you can find a copy of Matthew Engel’s Guardian Book of Cricket. We have been free to watch the game idly and give ourselves up with lazy delight to the June charm and flavours of a field all gay with tents and waving colours; and we have been free to observe the delicious changes in the passing hour – the full light of noon, the soft, silent fall to mellow. As Hubble and Freeman took up the defence of the Kent ninth wicket the band on the edge of the grass made the mellow music of the madrigal out of The Mikado. The moment was too tense, perhaps, for these golden strains, yet their sweetness was in tune with the afternoon’s lovely English flavour. To my dying day I shall remember gratefully these afternoons in Kent, afternoons full of the air and peaceful sunshine of imperishable England. But Kent no longer play at Dover. Indeed, no-one plays cricket any more at the Crabble ground, “tucked away in hills along which Lear must have wandered on his way to the cliffs”: nowadays, as Chris Arnot recorded in Britain’s Lost Cricket Grounds, it’s just a rather dreary rugby field, and the back cover photograph of Colin Cowdrey striding out to bat from a pavilion festooned with hanging baskets and thronged with a huge crowd an image of already distant history. And this summer I won’t be going to Horsham. 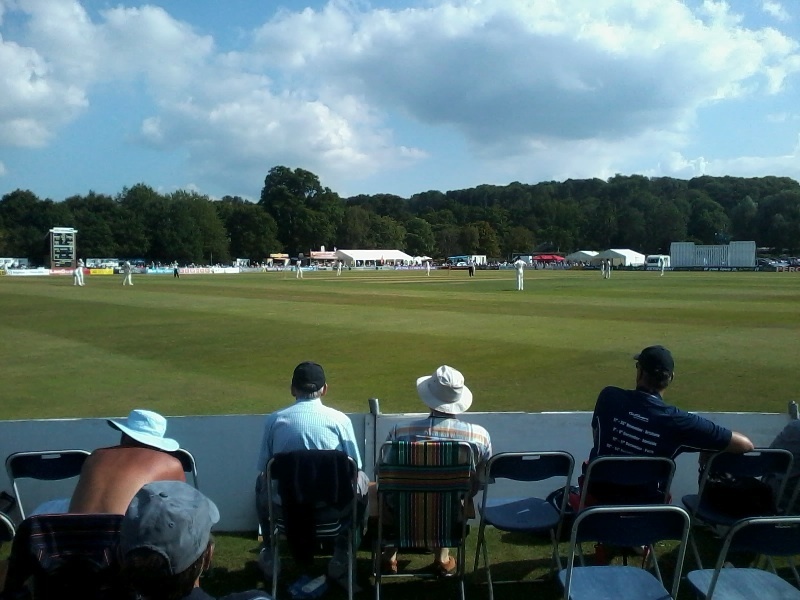 On financial grounds Sussex have cancelled their annual cricket festival. They’ll still go to Arundel, thank goodness, but that’ll be it. The last two years have been beautiful occasions at the pretty tree-lined ground beyond the church. I love the way that, approaching from the railway station and walking down through the town, you end up getting to a county cricket match via footpath through a wood, round a brook, and up a grassy bank. Last year the refreshment tent at tea hosted a stupendous array of home-made cakes. The beer tent offered nine or ten local craft brews. I bought a secondhand volume of Cardus from the cricket bookstall. When the sun hammered down after lunch you went and sat under the trees opposite the pavilion. Hove is now a well-appointed and always congenial place at which to watch the County Championship, but Horsham, like Arundel, was nicer. When I think of all the best days out I’ve had at county cricket, most of them have been at festivals – at Scarborough, Arundel, Southgate, Northwood (a lovely addition against the run of play for Middlesex last summer), Southend (the Victorian neatness of Northchurch Park, not the windswept wasteland of the later Garons Park), Chesterfield… And yet the trend among the counties in recent years has, as we all know, been inexorably against festivals, with many no longer taking the game to any outgrounds, and county cricket no longer played at Abergavenny, or Bath, or Bournemouth. I’m not going to engage with any of the usual reasons cited, from inadequate corporate hospitality facilities to expensive investments in county grounds to crummy dressing rooms – yeah, yeah, all confirmation that modern cricket at the top level is a business, even an industry. But it’s not the point, is it? Actually, I think it is all about investment, and marketing, and branding. We should do all those things, through the ECB – all the things that the modern game already does with Twenty20. Why do these festivals clash so often? Why isn’t there one every week of the cricket season from June onwards? Why aren’t halcyon posters advertising county cricket festivals visible at every railway station? Why isn’t ECB money tied to each county having to visit one new outground every season, and doing it properly? What is the point is that cricket, to a far greater extent than other sports, has always had a hinterland. It’s always not just been about the game. Cardus got that – wrote about it, indeed, all the time. And more than any other sport, with the possible exception of golf, it has always had an arcadian dimension, or potential. Cardus got that, too. That Arcadia need not only be realised on bucolic fields fringed with marquees and enfolded by ancient oaks – look at that sensational tableau from South Africa this winter, with Newlands “tucked away in hills” at the foot of Table Mountain – but it’s a lot more likely. When the big cricketers come to the small, pretty grounds they do seem “all tiny and compact”, as though in a painting - because the game is held in a wider landscape, like a country house at the centre of its estate, in which so much more than the match is going on, and so much more matters than who’s going to win. There is something to celebrate. It’s why they’re called “festivals”.